It’s Wednesday and you can be a winner! Actually, you already are a winner, because everyone’s a winner all the time! Don’t you feel better about yourself now? Okay – enough of pop psychology for today, now back to real life. Do something that makes you a winner today! “What should I do?” you ask. This time of year – coats are collected, presents delivered to strangers and homeless shelters receive more calls. This is good, but there’s eleven other months in the year. 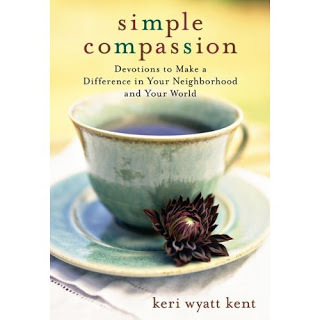 Simple Compassion is a 52-week devotional that talks about a lifestyle of compassion. Keri Wyatt Kent teaches the reader about genuine compassion, beginning with looking at ourselves and the reasons we do or don’t do compassion well. She shares personal stories of getting involved in inner city Chicago – from taking a class about urban leadership to handing her own hamburger, bought in the middle of a busy day of running errands, to a homeless man. Read one of the 52 short chapters a week and give yourself time to ponder the thoughts and challenges she presents about what Godly compassion should look like. Begin this book in January and by next Christmas, you could be a winner in showing compassion. Leave your name in the comment section (before Thursday at 10PM) and you could win this book. Winner will be posted on Friday. I like the idea of this book…lifestyle of compassion, not just motivated by the holiday. Genuine hands and feet of Jesus as it should be. I';ll have to look for it!